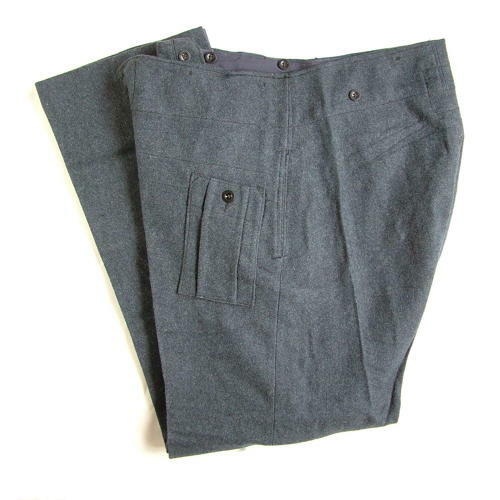 'War Service Dress Trousers'. By Sportswear Clothing Ltd. Size 18 (Ht.6'1" - 6'2", Wt. 38", Seat 44 - 45", Leg 33.5"). 1945 dated. Standard battledress trousers complete with buttoned open dressing pocket on the upper left leg. These are in superb 'as new' unused condition straight from the basement of what used to be an old outfitters. Very clean and with no moth damage. These are the largest size that were made which is rare to find. They could also be tailored to fit smaller frames if the buyer is intending to wear them. You will not find a better or bigger pair. Stock code U22604.